The claim that all human thought involves ""interpretation"", that all human thought is in some way relative to a contingent context of cognitive, rhetorical, practical and aesthetic considerations, has become widely accepted; but what we understand by ""truth"" and how we should best pursue it are questions raised with renewed force once a hermeneutical starting point has been embraced. 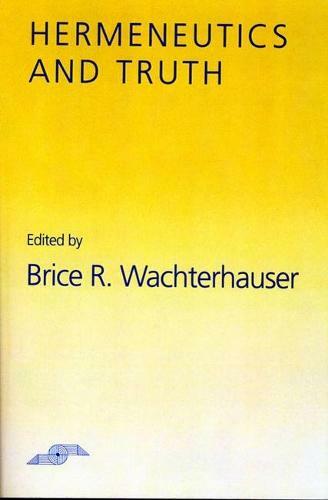 Brice R. Wachterhauser's collection, ""Hermeneutics and Truth"", is an attempt to contribute to this conversation. No thinkers have wrestled with the issue of truth and interpretation in more illuminating ways for the continental tradition of philosophy than Heidegger and Gadamer. Gadamer's essays ""Truth in the Human Sciences"" and ""What is Truth?"" appear here for the first time in English; the other contributors include Rudiger Bubner, David Carpenter, Robert Dostal, Jean Grondin, James Risser, Ernst Tugendhat, Josef Simon, Karsten R. Stueber, Brice R. Wachterhauser, and Georgia Warnke. Brice R. Wachterhauser is Associate Professor of Philosophy at Saint Joseph's University, Philadelphia, and the editor of Hermeneutics and modern philosophy. "Gadamer's work remains the "locus classicus" of Continental thought in this area . . . This collection will be a classic reader." "Gadamer's work remains the"locus classicus"of Continental thought in this area . . . This collection will be a classic reader." Steven Watson, University of Notre Dame"
"Gadamer's work remains the locus classicus of Continental thought in this area . . . This collection will be a classic reader."